What Does Code P0343 Mean? 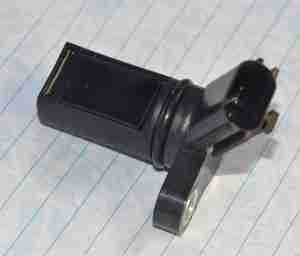 The camshaft position sensor reacts to a toothed wheel on the camshaft, which gives the ECU constant information on its speed and position. Of course, the CMP is located on the engine, usually somewhere on the cylinder head, so it transmits CMP data to the ECU using wires. 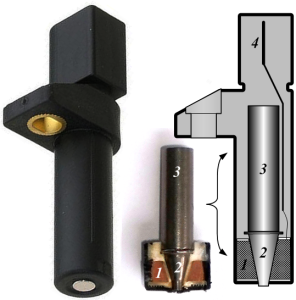 If the ECU detects high resistance, it will set DTC P0343 or DTC P0348 – Camshaft Position Sensor High Input. If your engine has only one CMP, such as an inline-four-cylinder, the only CMP code available is for Bank 1, P0343. On the other hand, V6 or V8 engines have two banks, Bank 1 and Bank 2, and would therefore have two CMPs, so DTC P0348 would refer to Bank 2. Sensor A indicates that the malfunction is occurring with the camshaft position sensor circuit that pertains to the intake camshaft. Sensor B codes pertain to the exhaust camshaft. High resistance suggests a broken sensor or wire or corrosion is more likely. What are the common causes of code P0343 ? Depending on year, make, and model, DTC P0343 or P0348 may have number of causes. Here are some of the most common. Ford Trucks / Mustang GT – An alternator phase problem, such as a blown diode or open coil, may cause so much electrical interference that the CMP signal gets distorted, causing a P0343 / P0348 DTC to set, among others, in spite of there being no actual problem with the CMP sensor or wiring. What are the symptoms of code P0343 ? How do you troubleshoot code P0343 ? Because P0343 and P0348 refer to a circuit problem, do not automatically condemn the CMP sensor. That’s not to say that it might not be the sensor itself, but replacing the sensor is not always going to fix the problem. Get out your wiring diagram and DVOM (digital volt-ohm meter) for this next part. Other Problems – In case no problems can be found in the CMP sensor or its wiring, it may be that P0343 or P0348 are simply auxiliary fault codes. A jumped timing belt, faulty crankshaft position sensor signal or circuit, or engine misfire, may be the primary problem. Double check these before coming back to the CMP. DTC P0343 or P0348 may be accompanied by other DTCs, such as P0300 Random Misfire, P0725 Engine Speed Sensor Circuit, or P0335 Crankshaft Position Sensor Circuit Malfunction. None found. Ask a question about P0343.